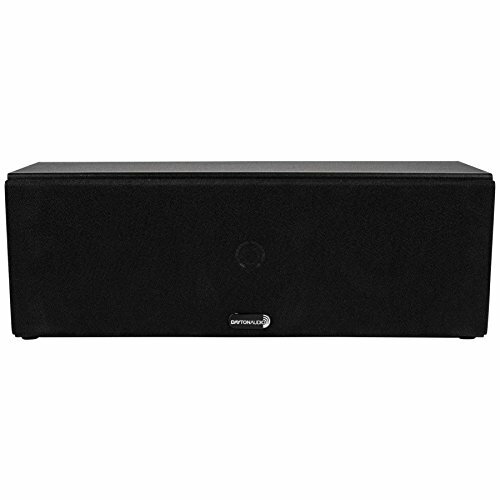 Put the finishing touches on your home theater with the Dayton Audio C452 center channel speaker. Use this dual woofer speaker to add depth to all the action at the center of the stage. Whether you are watching TV or movies, this speaker will perform as well as other speakers costing much more. The 2-Way design of the C452 employs dual 4-1/2" polypropylene woofers to produce the lows and midst while the 5/8" polycarbonate tweeter delivers accurate transparency to the dialogue of your favorite TV programs and movies. The sleek appearance of this speaker will blend into your home furnishings with its black vinyl finish. Rubber feet and keyhole brackets are included so you can mount this center channel to you wall above or below your TV, or place it directly on a shelf. Speaker wire is included with the C452 so you will be ready to install it right out of the box, and hook up is easy with the quick connect spring loaded terminals. Specifications: Power handling: 60 watts RMS, 120 watts max Impedance: 6 ohms Woofer: Dual 4-1/2" polypropylene cone with 4-layer voice coil Tweeter: 5/8" polycarbonate with Ferro fluid cooling Frequency response: 85-20,000 Hz Sensitivity: 86 dB 1W/1m Crossover: First order high pass Dimensions: 5.5" H x 15.75" W x 5.7"D.